I am currently researching industrial thermal printers for barcode printing and struggled to find solid information that was easy to follow. In this article, I will provide a Zebra ZT230 review based on consolidated information across multiple sources which should save you some time in your purchasing journey. p.s. Read through, there are helpful videos and links throughout. p.s.s. Want to see the price before reading the full review? Click here to skip to the ZT230 buying section. The Zebra ZT230 is one of most affordable industrial printers offered by Zebra Technologies. Its design incorporates years of customer feedback and has greatly improved upon older generation models. This specific model is very durable and engineered for easy setup, customization, maintenance, and daily use while supporting multiple functions. It has gained popularity as a very affordable industrial thermal barcode printer. 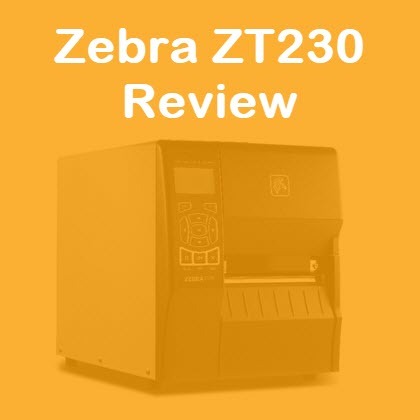 The following sections will break down the Zebra ZT230 features, use cases, setup, maintenance, accessories, and other important details. The Zebra ZT230 comes in various models that, for example, come standard with Ethernet connectivity or 300 dpi. The details throughout the remainder of this article are fairly standard across all models. When you buy a ZT230, make sure you carefully review and compare against the exact specifications you require. With that said, lets jump in. At first look, you will notice the Zebra ZT230 consists of a smooth all metal case finished in a grey (and very typical) industrial two-tone color scheme. The front panel contains an adequately sized icon-based LCD screen to assist with selecting printing and system settings. At about 10″ wide and 17″ deep, this small industrial barcode printer has a very tiny footprint compared to other printers on the market. The hinged bi-fold cover only needs 4″ of clearance saving precious square footage in your warehouse or office. Media loading is a breeze with the Zebra 230. Inside, this monochrome thermal printer contains yellow color-coded parts that act as visual cues to assist with loading your ribbon and labels. A movable sensor illuminates through the media to assist with adjusting the print sensor position. Print quality is enhanced by the ZT230’s Element Energy Equalizer and is in line with what you would expect from a commercial thermal printer. Bar codes will print clean and crisp, even on narrow media. The ZT230 printer does more than just barcodes by supporting a variety of labeling applications such as shipping labels, tags, packing lists, and more. These Energy Star compliant printers will also help you save energy — and your hard earned money! Most models of this industrial thermal printer connect via USB or serial / parallel. Unless you buy a specific model which includes more features, you will need to pay for additional add-ons such as 10/100 Ethernet, 802.11 a/b/g/n wireless, thermal transfer printing, the ability to print in 300 dpi, or a ZT230 Ethernet Print Server that allows you to share multiple printers on the same network. The Zebra ZT230 comes with the Link-OS environment which makes it easy to integrate, manage, update, maintain, and develop applications for your Zebra printers from anywhere in the world (with an internet connection of course). Users can even gather data to assist with making smart business decisions based on new analytical driven insights. Link-OS also includes applications and a software development kit (SDK). With the SDK, you can develop your own Zebra ZT230 applications to meet your needs with precision. It is important to note Link-OS itself will only run on Windows and will not work with Apple or Linux operating systems. The following table provides specifications for the Zebra ZT230 thermal printer. The Zebra ZT230 is a perfect fit for industries such as healthcare, transportation, retail, manufacturing, and logistics. With the ability to print 1,500 (some say 10k) labels a day, this commercial ready thermal printer will handle just about anything you can throw at it. Ensure you use the device settings to select the proper print type (direct thermal or thermal transfer). Also, if you are using thermal transfer labels, you will require a ribbon for printing. To keep the Zebra ZT230 running smoothly, clean the print head frequently and use a ribbon that is as wide or wider than the label roll. Make sure to inquire with the re-seller about warranty options as well. Try to always use genuine Zebra supplies to guarantee a consistent print quality, reduce downtime, and prevent productivity impacts. As a recap, the following video covers everything from the initial Zebra ZT230 setup to loading labels and installing a ribbon for thermal transfer printing. As mentioned earlier, the Zebra ZT230 has many accessories and add-ons you can purchase separately to accommodate your specific needs and avoid buying things you will not use. Ready to buy? Click the following link to check the price and buy a Zebra ZT230 printer on Amazon. You can always buy from a local reseller, but you will likely find find the best deals online. A USB cable for the Zebra ZT230 is typically included with your purchase. If you lose your connection cable or need a replacement, you can buy an aftermarket USB printer cable at a discounted price online. While not as common, the ZT230 can also connect via serial and parallel as well. As mentioned previously the Zebra’s parallel port usually goes unused, that is, unless you buy a ZebraNet 10/100 Print Server that plugs into your printer’s existing parallel port. Adding a print server allows you to connect your printer to your network via Ethernet and enables the use of ZebraLink Web View and Alert features. The Zebra ZT230 supports ribbons with a width of 1.57″ (40 mm) to 4.33″ (110 mm) and comes in black and other colors like red and blue. Ordering ribbons can be tricky, so I suggest checking out the list from uline’s site. The ZT230 supports labels that are 0.75″ (19.4 mm) to 4.5″ (114 mm). There are a dizzying amount of labels for just about anything you can think of, especially in the bar code label category. Aftermarket labels run about a half cent to four cents each depending on the size and count. For example, here are 2000 direct thermal perforated amazon barcode UPC labels for a great price. You can print UPS and FedEx labels with ease using the BarTender barcode labeling software. Discounts usually come with larger bulk license purchases like the Seagull Scientific Bartender 80-printer edition. Help: Inside the cover of a Zebra ZT230 is a QR code that can be scanned with the QuickMark app. Once scanned, you will immediately be taken to a mobile friendly help page on Zebra’s site. This is a nice touch and something more companies should adopt. General Specs: If you are looking for high-level details, you can find general specifications for the ZT230 by clicking here. Technical Specs: Need more geeky details? If yes, click here. Support & Drivers: Additional support and Windows drivers for the ZT230 can be found here. I scanned through dozens of online reviews and would say the Zebra ZT230 comfortably receives 3.5 – 4.5 stars consistently from customers. A consistent theme is business owners buy Zebra ZT230’s to replace multiple smaller thermal printers and/or to use in their warehouses. They are impressed with the quality, speed, easy installation, and compact size. They like the fact that this medium sized industrial thermal printer offers the capabilities of “giant models”. One person mentioned the ZT230 worked reliably in their warehouses in Georgia indicating the high humidity is no problem for this device. While most comments are positive, there are always areas for improvement. Many complaints were focused on features and parts end users thought came with the printer like the thermal ribbon payoff real or specific label printing software. I saw one review with valuable feedback – apparently the the label sensor is placed a tad too far to the left which cases it to be more sensitive to label placement when compared to other models. Unless you have experience with other thermal printers, I doubt an average user would notice this nuance. Overall, I did not come across critical feedback that would be a deal breaker to prevent the purchase of this thermal printer. If you are looking for a compact space-saving entry level industrial thermal printer at a great price, the Zebra ZT230 is the perfect option. Have a small warehouse? Do you need to save time printing shipping labels for your eCommerce business? Perfect, the Zebra ZT230 will have your back and the ability to print up to 1,500 labels per day should be more than enough to cover your needs. Did you like this Zebra ZT230 review? If yes, please help others find this article by sharing it with your friends or other business on social media. Feel free to also link to this article from your blog or website. Thanks!